This weekend, we picked close to the last of the tomatoes, some butternut squash, an eggplant, a couple of bulbs of celeriac and some peppers (hot and sweet). While the crisp air lent itself to a wonderful bike ride down the Harlem Valley Rail trail, I couldn't help but be sad that the days of harvesting a portion of dinner straight from the garden are almost over for the season. Our own tomatoes in particular have been so wonderful - heirloom and bursting with flavor. We've enjoyed them in salads with mozzarella or burrata, slow roasted with a drizzle of olive oil and some slivers of garlic, and most recently, in a wonderful, fresh tart. I had high hopes of canning and preserving some of the flavor of summer - but alas, we were so excited to eat as we went, we left nothing behind. The idea behind the recipe started here. But the free-form shape was tricky and the dough a little too loose to be easily worked with. Some poking around churned up this and the dough was lovely and a keeper. Similar to the first recipe, I grated a semi-hard cow's milk cheese onto the unbaked prepared crust that I placed into a removable bottom fluted tart pan, and then used a mixture of multi-colored heirloom cherry tomatoes and the most wonderful currant tomatoes to fill the tart. The cherry tomatoes were fine mostly cut in half (larger ones quartered) and the currant tomatoes were left whole (if you can find some, buy them - they are bursting with flavor and so unusual to look at). The result? 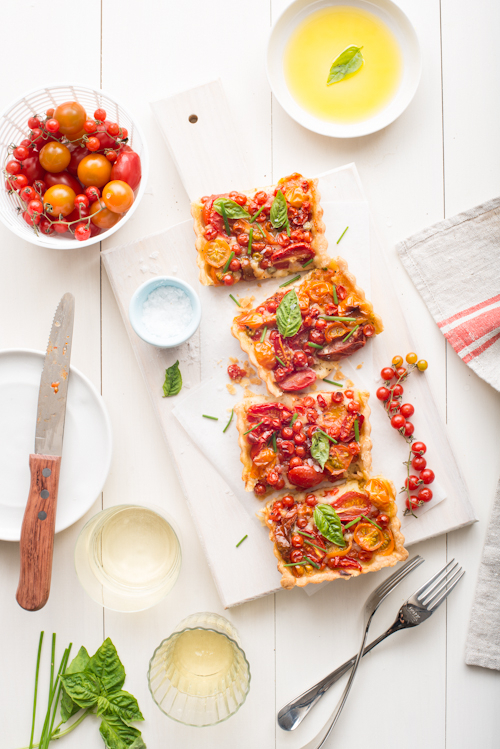 A wonderfully flavorful roasted tomato tart that was as beautiful to look at as delicious. 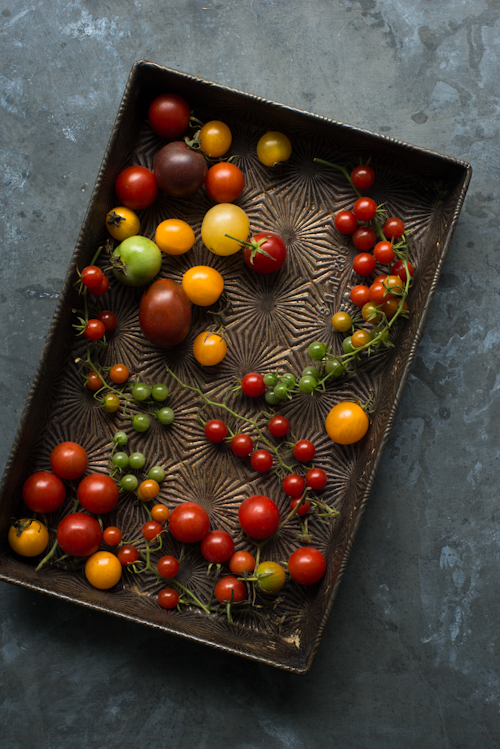 It was a treat to explore a new way to savor the last tomatoes of summer. Preheat oven to 375°. Roll chilled dough into a rectangle about 1/8 inch thick. Press into a removable bottom tart pan of desired shape. Sprinkle with cheese. Fill with tomatoes. Season with salt and pepper. Bake for ~40 minutes or until crust is golden and tomatoes are popping. Remove from oven and allow to cool. Sprinkle with additional salt and pepper to taste, fresh herbs, and drizzle with a nice olive oil.